11 Best Gaming Routers 2019 - The Ultimate Showdown! Home 11 Best Gaming Routers 2019 – The Ultimate Showdown! 11 Best Gaming Routers 2019 – The Ultimate Showdown! 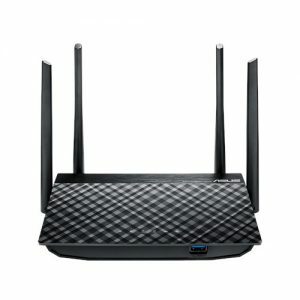 So which is the best gaming routers for my need? In order to answer that magical question, we have invested hours upon hours of time in testing some of the most talked about gaming modems out there. We have gone from one brand to the next and have also considered the pros and cons, well at least the ones we think you’d be interested in. Everyday people as well as official testers have provided their opinions but we know for a fact that there is no single best wireless router out there. And so we’re here to provide you with more than you need, in the end the ‘best’ is up to you. Here is the list of top 11 gaming routers which the ConnectionCafe team thinks it the best in the market right now. At first glance the Nighthawk X6 AC3200 might be a little intimidating because of the design but it works like a charm and there wasn’t much hassle when we set it up. Let us say that it’s an incredible innovation in the world of router with its Tri-band Wi-Fi; the wireless router is able to deliver numerous bands for the user’s home as well as all the Wi-Fi devices under it. Reaching speeds up to 3.2 Gbps and 6 high performance antennas, it has earned its place among the best gaming router 2019. 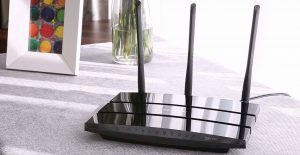 The 6 antennas that you see on the side are not just for display, they help enhance the performance of the router itself as well as amplify the coverage of the signal. We know that some of you are use the NETGEAR Nighthawk R7000, of course it’s a great router in its own right but once you experience the features of the Nighthawk X6 AC3200 you’d regret not switching sooner. The Nighthawk X6 AC3200 is easy to install and you can even upgrade to an AC Wi-Fi with the help of your local service provider gateway; after installation your computers, tablets, smartphones as well as other devices can be covered. Here’s an additional feature for users that have children under their roof, the router offers parental controls that can help filter certain websites. Not only that, but a certain feature that we loved was the guest network access, it hosts a separate and secure access for all guests. Can host more than 20 devices, up to 28 devices in our case. Thanks to the readyshare feature, we were able to easily connect our external drive to the gaming router and access it from computers outside our home network. Another feat accomplished by this gaming router is the ability to turn off ALL the lights, well maybe with the exception of the power light. Of course it’s not a big deal to some but the lights can be annoying at times. A NETGEAR Genie application can be used on the gaming router in order to better manage the web-interface. The router comes with its own VPN options, these options are not offered by router alternatives. With the help of the explicit as well as implicit beamforming+, the device can focus and deliver Wi-Fi signals for each and every mobile device. There are times when we needed to reboot the router, but not on a daily basis of course. For a popular product, obviously their customer support lines are busy 24/7 so it’s quite difficult to contact them in case we had inquiries or concerns regarding the unit we bought. Once or twice the connection dropped and we didn’t really know why since only a handful of devices were connected during the signal drop. So if you’re looking for an amazing router that can handle the demands of gaming alongside numerous other devices, especially when videos and other media are concerned, then this is definitely the router that you should invest in. We give this a 7.5 out of 10 basically because of the service lines and not the product itself. Any inquiries that you have for the customer support regarding their product will be best answered through email and not phone. They typically answer within 24 hours so that’s not all that long compared to others. Plus, according to other reviews, their staff are incredibly friendly and helpful; user only needed to call once during the entire time that they owned the router. If you are looking for top-notch router with a slew of excellent management features, superior connectivity and superfast performance, you may want to look at what RT-AC88U has to offer. It comes with a matte-black housing with angular sides and a beveled top. The router’s front is where you’ll find clear LED indicators for wireless activity, power, USB port activity, internet (WAN) connectivity, LAN connectivity, and Wi-Fi Protected Setup (WPS). It has four removable exterior antennas: one on each side and two at the back. At the back, you will also come across a reset button, a WPS button and a power button. It has numerous ports at the rear too, including eight Gigabit ports (Ethernet), a WAN port, a USB 2.0 port, and a power jack. The front of this router has a USB 3.0 port; it’s behind a small panel. The router has a Broadcom 1.4GHz dual-core processor and NitroQAM technology, which enables it to deliver up to 3,167 Mbps (2,167 Mbps on the 5GHz band plus 1,000Mbps on the 2.4GHz band). It has rich management features which you can access through a mobile app and a user-friendly web interface. The general settings page has a Network Map and taps that you can use to access the Guest Network page and the Quality of Service (QOS) page that aids in prioritizing bandwidth for particular apps. It also comes with a bandwidth monitor for displaying download and upload speeds. The traffic analyzer page has a graph that shows daily client usage. It also shows charts for outgoing and incoming data packets for wired and wireless network clients. The router has excellent Ai features. The AiProtection feature uses the Smart Home Network solution for monitoring and detecting malware and blocking any malicious sites. The feature also offers parental controls which include app filtering and time scheduling. The AiCloud feature allows you to access data from a tablet or smartphone that uses an Android or iOS application. The router’s advanced settings allow you to enable WPS settings, create wireless SSID names, choose a security protocol and a method of authenticating it, and configure wireless bridge settings, VPN and RADIUS. On the router’s Wireless Professional Settings page, you may adjust settings such as multicast rates, beamforming, beacon intervals, and wireless settings. If you’re looking for the best modems for gaming, the RT-AC88U will satisfy your need because it uses 1024-QAM technology making it superfast with a dual-core processor. The 5GHz band delivers up to 2100 Mbps making it 80 percent faster. The 2.4GHz delivers up to 1000 Mbps, making the router 66 percent faster. Its 4T4R (4-transmit, 4-receive) antenna design gives you the widest-ever coverage of up to 5000 square feet. It has expansive connectivity options with 8 x Gigabit LAN ports that allows up to eight devices (Ethernet-compatible) to connect simultaneously. Trend Micro’s AiProtection gives you a safe and secure online experience. The AiProtection feature combines automatic vulnerability detection, parental controls, and malicious site blocking. The built-in USB 3.0 and USB 2.0 ports which allow up to ten times faster data transfer to US storage gadgets, 3G/4G dongle support and print sharing. The ASUS Smart Connect delivers bandwidth consistently by dynamically switching your devices between 5GHz and 2.4GHz bands depending on load, signal strength, and speed. It has ASUSWRT graphic user interface for a CD-free, easy setup and a trouble-free advanced network control. Its USB 3.0 is awkwardly placed and when connected to an external hard drive, you may have average NAS performance. 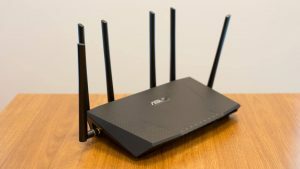 This ASUS gaming router is packed with useful features. It is safe and secure for the entire family, easy to set up and has a fast throughput performance. It’s a worthwhile investment for every homeowner and avid gamers alike. You can check more about it here. Simply a dream come true for people who adore the Apple brand and who can blame them? Apple has pioneered dozens of technological designs in phones, tablets and computers so why not enter the world of routers? 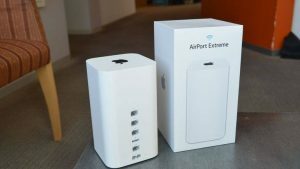 We’re going to be honest with you and admit that we were skeptical about the AirPort Extreme, sure Apple was a good brand but for other devices such as a good router for gaming, we weren’t so sure. After a considerable amount of time testing and trying out the router, it was a pleasant surprise to know that the AirPort Extreme exceeded our expectation. 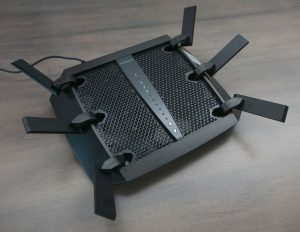 We absolutely loved its main features like the 6 antennas found at the top of the router itself, it’s not there for aesthetic appeal though it helps enhance and hasten the overall connection. As for the dimension of the router, at 6.6 inches in height a base measuring only 3.85 inches it’s quite compact compared to other routers. The data rates can reach up to an astonishing 1.3 Gbps and compatible with the following specifications: 802.11ac, 802.11a, 802.11b, 802.11n and 802.11g. The set up was easy, no confusion caused by numerous lights blinking at you and the ports are effectively marked. As for the aesthetics, take a moment to appreciate how sleek and classy it looks. You can place it anywhere without it being an eyesore; some routers tend to look like robot spiders or something along those lines. The wireless router is compatible with any device, regardless of the brand; the connection or access is not limited to only Apple products. The coverage is quite wide, even at the second floor of a house with concrete walls and floors the signal can still go through. Connecting it to an Apple TV is also quick, no more buffering of any sort. Even compared to earlier versions of the Apple router, this one stands out when it comes to performance. The major problem experienced by many others, except for us, was the packaging. No, it doesn’t look bad but if you were unaware and you opened the box at a height it’s highly likely that the router will hit the ground; there is nothing holding it except for the box itself. It features only a single USB port. Once in a while, when the connection slows or access suddenly becomes difficult the owner has to restart or reboot the router. Only a dual band is available for the 802.11ac specification, though this might not be all that bad for some it means everything to other potential buyers. Connecting child video monitors have a high chance of affecting the signal; this is caused by the high ping time. Overall it’s an incredible deal and we loved almost everything about it. Not only can it become your dream router for gaming but even if you don’t play and happen to have a ton of devices which you use all the time then this is the one for you. Like any other product by Apple, the Apple AirPort Extreme Base Station offers quality in performance as well as durable hardware. For us, the AirPort Extreme is a solid 10 out of 10 since none of the cons were deal breakers and we didn’t really notice them. ASUS has really made its mark in the world of routers for gaming, of course routers that are for gaming can also be used in normal everyday internet activity, it just so happens that they’re incredibly fast. Now we already wrote a review about a top gaming router manufactured by ASUS but we couldn’t get enough of the quality from the brand. Some of the features that we absolutely loved about the ASUS AC1900 include the easy set up, yes we’re a sucker for easy setups; who wants to go through a tedious manual anyway? It’s also dual band, as the name states, alongside the latest 802.11ac 3×3 features; combined speeds can reach up to 1900 Mbps. Outside threats will never actually go away and as we create better wireless technology, others will develop more advanced threats. Not to worry though, the ASUS AC1900 includes AiProtection which provides layers upon layers of protection from any threat; website blocking, vulnerability protection and the prevention of infected devices from transmitting data are just some of the security measure. At first we didn’t want to be all that comfortable with the protection, until we tried ‘attacking’ and hacking the devices, it was actually the first time we were happy we failed. ASUS AC1900 is powered by a 1 Ghz dual core processor, so even though over 10 of our staff members watched videos online at the highest resolution and a few others played games online there was no glitch or connection failure. The design of the router is quite compact, even smaller compared to all the other routers we handled, which is a good thing. From unboxing to a successful set up only took us about 20 minutes or so, if it seems too long well we weren’t really in a hurry. Can handle over 20 devices connected all at the same time, regardless if some of them are wired. The guest account option work like a charm, it keeps the guests from downloading huge files as well as torrents. To get a clear idea as to how far the coverage goes, we tried it in a three-story home with an area that’s over 3,500 square feet. No matter where we were, even at the farthest corners, we could still connect. No problems arise from networked home computers. ASUS website itself lacks an informative operator manual concerning the router. Parental controls has proven to be quite helpful, we were able to turn off the connection for certain devices at fixed times; no more late night browsing for the youngsters. It’s not wall-mountable, well routers aren’t typically mounted on the wall but in case you were hoping to do so, you have no choice but to find an area for the ASUS AC1900. From time to time, some users have experience a sudden drop in connectivity with no obvious reasons. Some users who have owned the ASUS AC1900 for far longer than we have, experienced problems with firmware update. 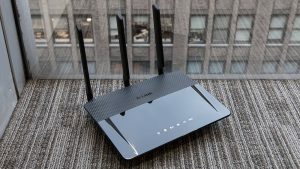 Unsuccessful firmware updates, even those with the slightest errors have caused loss of connection to wireless devices; disconnection can range from a few seconds up to an hour and maybe longer. In the end, after taking into account all the pros and cons, we were quite impressed with the performance of the ASUS AC1900 Wireless Dual Band. It’s a great option for routers for gamers and everyone else who simply need a speedy and strong connection. Just keep in mind to choose and successfully install your firmware, seeing as though this has been the main cause of connectivity problems among other users. We also give this router a solid 10 out of 10 because it surpassed all of our expectation. ASUS continues to produce amazing gaming routers for PS4, Xbox One and everything in between. Now they upped their game even more by creating a wireless router with incredible aesthetic appeal. I personally loved this design, sure the other big and bulky routers have their own unique appeal but tons of antennas and a wide frame can be quite irritating; when you or a guest enter the room your eyes would immediately shift to a big bulky router, the LED lights don’t help much either. The best Wi-Fi for gaming doesn’t have to come with the biggest and meanest machines, a fancy ASUS OnHub can do a spectacular job. In reality, routers are not like phones where we often purchase the latest ones available in order to replace the existing router. Many of the routers that we purchased way back when, unfortunately can’t handle the kind of streaming and sharing that we need to do on a daily basis. The ASUS OnHub is one of the best gaming routers out there. Aside from being able to keep up with the demand of numerous devices that I had tested, it’s also incredibly user-friendly. Personally, I’d prefer a smooth setup even though it might take longer, instead of one that takes a few minutes for set up and hours for troubleshoots. So I loved the fact that the ASUS OnHub comes with an application, on the application we followed a simple guide which was easy enough to understand and if we encountered problems it stated possible solutions. Internal antennas offer better performance and certain power amplifiers as well as fine-tuned radio frequency design helps widen the coverage of the signal. It’s associated with Google, which is a brand that we trust and we were confident with the overall quality. Any device can easily connect with the router, regardless of the brand; all our Apple products can be connected in a short moment. Even when used on a large area, we we’re pleasantly surprised to see that there were no dead spots; our area was around 1500 to 2500 square feet. Overall the connection is consistent and stable all throughout the 15 devices that we used; no restarting, rebooting and location change needed. The setup was so simple and easy that a child can do it without a hitch. Of course since it is wireless in design, it’s the least annoying router to use and setup; no tangled wires everywhere. We set up the router using my Google account, you can’t set it up without an Android or iOS devices. It’s a rare circumstance to not have either but still there’s that tiny possibility. One of our users complained that their iPhone 6 plus could only get a 20 to 300 Mbps connection. Changing of the IP block is not allowed, so you’d have to stick with what it gives you. Because of the design of the router, it only has one Ethernet output port, which may be a deal breaker for some. There’s also an astounding lack of administration options. For people out there who don’t need more than one Ethernet output port, the ASUS OnHub can be the best router that you’ll use and lay your eyes on. Even when 5 or 6 of us were gaming it could handle the usage and our gaming session went smoothly. Aside from gaming, it could also handle streaming, downloads and everything in between. With ASUS OnHub we were able to use our devices whenever and wherever we wanted in the area, even at the rooms farthest from the router. A 9 out of 10 for us, since many users out there would prefer more administration options; keep in mind though that the lack of administration options does not affect connectivity in any way. In terms of the space that you have to prepare for this router, it doesn’t really need all that much; the TP-Link OnHub is as compact as it is sleek in design, even in our own testing we just placed it on top of a couple of books and it still looked good. 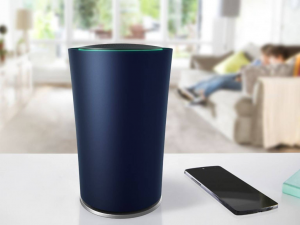 Dead zones that we experienced from past routers have completely been eliminated with the TP-Link OnHub. Thanks to its 13 internal antennas, every inch of our area and more was covered. Based on our experienced it’s a strong contender for the best gaming routers for Xbox one and PS4; gaming was an absolute breeze and the connection was incredibly stable. For this particular router we had to go to an area with about 2,500 square feet in order to test the coverage promised by the product, it proved to be honest much to our delight. After asking around we discovered that it can cover even a 3000 square feet home with two floors and that’s saying something. Wi-Fi speeds of up to 1900 Mbps is possible, we could download, play and stream a whole day away. In all honesty, how a small and sleek router can possibly do that is quite astonishing. We could connect 20 devices at the same time without encountering problems with the connection but the package says the TP-Link OnHub can support over a hundred devices all at the same time. Of course we didn’t have 100 devices or people to test with. Users can download a companion app which quickly setups the router and control network for you with just the help of your smart phone. There’s a separate guest network for all your visitors and friends. Since we only used it for a certain period of time, we were not able to come across security updates. But according to other users, security updates occur automatically so you won’t need to keeps your eyes open. 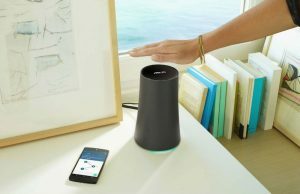 The TP-Link OnHub comes with a 2 year warranty as well as 24/7 technical support. We could easily monitor the bandwidth usage of every device as well as individual data consumption for more than 30 days. Prioritizing items was easy as pie, but there was a time limit though. Incredible aesthetic appeal, of course this doesn’t really affect the performance but at least you don’t have to hide it somewhere. The options are quite limited, we can’t change the IP range no matter how hard we tried; this is a deal breaker for many people. There are no parental controls whatsoever, so you can’t limit the usage of some devices owned by your children. Only one Ethernet port is available, mainly due to the design of the router. There is no iPad or laptop management, so if you’re used to that you might find this little con extremely irritating. Based what we experienced and read from other users’ reviews, we can confidently say that this is an amazing router. But for those of you that are looking for a router with tons of features and options then you might be disappointed with this one. This router was made for people who solely focus on the speed and stability of the Wi-Fi connection. Also, as we mentioned, it can’t filter out certain websites or cut off the connection from certain devices; these are essential for people with children in their homes. Since we don’t have to worry about children in our homes, it’s still the one of the best routers in our opinion. A 6 out of 10, mainly because of the parental controls and administration options; you may not realize it but these are incredible deal breakers for many. Sad to say, a lot of people out there are struggling with the strength and stability of their Wi-Fi connection even as we speak. Oftentimes it is the owner who adjusts to the router and Wi-Fi signal; they would transfer to other rooms because theirs were dead zones, they could only stream at night when few people were using the network and start gaming when everyone else was asleep. If you’re experiencing the same situation then this calls for a better router setting for gaming and every other usage. In case you don’t really feel up all to the aforementioned routers then this one might be your ideal choice. Homes all over the world will never have a uniform shape and size, so oftentimes routers will have difficulty covering certain ones. For that reason, the NETGEAR AC1750 is able to provide amazing signals and connection no matter where you are in the house, all thanks to the manufacturers who know how to avoid such hassle for homeowners. The product details promised Wi-Fi speeds that can reach up to 1750 Mbps. However in our case it only reached 1600 Mbps on a regular basis, but of course there are times when it exceeded the limit. We didn’t need to worry about the speed even though its wireless thanks to the dual core processor. Plus, there’s even backup software that automatically safeguards all our files; best of all that software is free. The router can handle about 12 or more connected devices all at the same time. Even when we connected about 15 devices and started a gaming session, the connection was very stable and the speed wasn’t all that affected. There’s an option to prioritize certain bandwidth streaming for specific usage like downloads, video and music streaming. USB 3.0 can process connected devices a lot faster especially media storage devices. Homeowners with children will be happy about the parental controls available with the NETGEAR AC1750. We tried it just to check the how effective it is, well not only was it effective but it was pretty easy to use. A feature called Airtime Fairness can greatly prevent network lag, this happens when painstakingly slow devices connect with your network. The NETGEAR AC1750 has 3 external antennas, as you can immediately notice. These antennas alongside high powered amplifiers improve the overall range of the connection. Best of all, it offers remote access, you can connect any AirPrint compatible printer and access media files on the network. NETGEAR produces numerous products and it’s a famous brand on an international level. Brands like these are difficult to contact most of the time, the customer service line is a bit busy so the next best option is to email them. 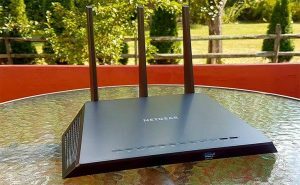 The perfect router for homes that have 15 devices, or less, which require internet connection. The user manual which comes with this particular router is quite tedious, but hey if you don’t mind then it’s not really a con after all. As you may have noticed in our former reviews, the routers were made for heavy and busy network usage by over 20 devices. If you have a small home with not even a fraction of that many devices, then the NETGEAR AC1750 is the best and most practical option for you. So if you’re a homeowner that’s looking for a better router for your humble home which has kids in it then look no further than the NETGEAR AC1750. All in all we give it 8 out of 10 for its practicality. 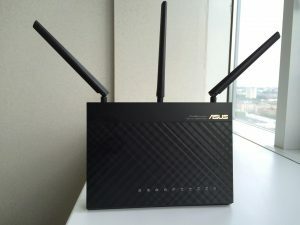 No surprise that yet another router from ASUS has made our list, the ASUS RT-AC3200 may be another ASUS product but compared to the other ASUS routers it has features that only belong to it. The Smart Connect feature of the ASUS RT-AC3200 is something that we find extremely handy. It automatically chooses and picks out the best and fastest band for each and every connected device; choosing is mostly based on the demands and capabilities of the said devices. The router offers two built in USB ports, specifically a USB 2.0 and USB 3.0 that provides quick data transfers as well as printer sharing. Unlike the earlier version of routers, the ASUS RT-AC3200 does not need a CD set up thanks to the advanced network control; our set up only took a couple of minutes and with no difficulty at all. During our extreme usage, it could balance the tri-band 2.4, 4 Gigabit Ethernet ports, both USB ports and the dual 5 GHz networks. The multiple antennas that you can immediately see on the router helps widen the overall coverage of the signal; a stable signal is achievable even at the farthest corners of our area. We tried to mimic a typical home, where the bandwidth usage greatly varies and constantly moves from one place to the next. The Tri-Band Smart Connect feature can effectively manage all the traffic from each and every device; it moves devices from one band to the other, mainly based on speed and signal strength. Trend Micro powers the AirProtection, as the name states it protects the connected devices from outside threats. We also tried to ‘infect’ the network with the most common types of virus and the AirProtection worked like a charm. The ASUSWRT user interface provides amazing access to the installation of the router. There are a lot of small but convenient features on the interface. When it comes to router app, the ASUS Router App was quite easy to manipulate and manage from the time that we setup the router to the real-time monitoring of network traffic. Not only that but we were able to manage the connection and security setting of each and every connected device. We highly appreciate the guest network options which are ideal for all your visitors. It only takes a couple of minutes to set up and it allows you to separate LAN subnets with a few simple clicks of a button. If you’re into those big bulky machine designs then this would be an ideal router design for you. The most common problem we encountered with such a prestigious brand is the customer service support lines. They’re extremely busy, quite understandable if you think about the sheer amount of customers they have. What might be a pro to some will be a con to others, some of the users that we invited were not that attracted to the design of the router. It was quite big and definitely required more space compared to other routers. Overall we loved the performance of the router, it’s as powerful as it appears and has performed great even though we really did put a strain on it; 20 devices all tuned in with various activities is saying a lot. Since we only used it for a definite period of time, we didn’t actually come across any firmware updates we don’t have a definite idea as to how difficult these updates can be. We give it an overall 7.5 out of 10, our reluctance comes from the sensitivity of the firmware according to other users; take note that only the firmware and not the router. Surprise, surprise a router from D-Link made our list! And with good reasons too, at first we were reluctant to try it out since it doesn’t usually top the list of the best routers out there but what convinced us was the overwhelming amount of positive reviews from gamers. A lot of other reviews have testified that the D-Link AC1900 solved all their connection problems especially when gaming was concerned. Before encountering the D-Link AC1900 they had to endure sudden disconnection from their gaming devices, multiple reboots and constant unstable or weak network connections. With that in mind, we decided to test it out for ourselves. In terms of appearance, even though it still has noticeable antennas, the D-Link AC1900 has a sleek design. There are two USB ports, we were able to successfully connect numerous storage devices and even printers without a fuss. Another nifty feature was the Smart Connect Technology, it basically reviewed all the connected devices, and afterwards it selected the quickest Wi-Fi for each device. Both Gigabit Wan and LAN ports offer incredibly fast connections for all devices, plus we didn’t experience any noticeable lag of slowing of the connection; typically a 600N and 1300AC Mbps performance. Beam Forming from the device enhances the coverage by adjusting the bandwidth to our device even as we went from one place to another in our area. No matter where we were, the connection was pretty solid. Of course our test also involved connecting movable devices, stream or download media files all the while moving from one room to the next; no buffering, loading and lagging. We mentioned that the design of the router was pretty appealing, it was even more appealing when we discovered that the antennas could be removed. The application that comes with it provided us access to manage the router from our smartphones and tablets. The setup was fairly simple and it didn’t take us longer than 15 minutes or so; we took our time with this one. The management page is not at all intimidating in any way compared to some of the other brands. Able to easily handle 10 of our wireless devices or so, before you think that it’s limiting keep in mind that it was meant to handle only so much. Comes with a guest network, not only is this network useful but still so very simple so set up. The router was made to handle only so much, so if you connect an average of 12 wireless devices or more then you’ll crowd the network. Only able to handle about 7 devices simultaneously streaming media files in HD. The router can only function and run as quickly as your internet connection, which can be quite a shocker for many people out there. As we mentioned, the management page had easy functions and a few found them to be too easy for their liking. If you were looking for an amazing and yet practical router for your humble home then the D-Link AC1900 might be just the one you’re looking for. This is especially true for homes that contain an average of 10 wireless devices or less. Purchasing heavy duty routers when you won’t be able to remotely fill the maximum load is quite impractical. The device was specially made to handle only a moderate amount of load, but the performance can match all the other heavy duty routers out there. All things considered we give it a good 8 out of 10 rating. Okay by now we have gone on and on about how amazing this particular router is or how powerful that one was but how about one that fits a small budget? Or maybe you’re only reluctant to invest more since you want firsthand experience with a product? We introduce you to the TP-Link Archer, one of the best gaming router under 100 dollars. Now don’t be all that critical about the router, you might be surprised by its level of performance. A cheap gaming router may not ask the same amount as all those other powerful routers, but it can keep up in many aspects. The TP-Link Archer features six antennas for a better signal coverage in your area. We repositioned some of the external antennas to see if the focus of the network would also change and it did; this is great if you have certain areas in your home where you want the connection to be stronger. The amazing mobile interface helped us set up the router in no time; for future reference, it’s the TP-Link Tether app available for iOS as well as Android. Two USB ports allowed us to connect to printers and external storage devices all at the same time; we printed, shared and listened to all sorts of media files without trouble. We connected 15 varying wireless devices and they could all do their thing without being disturbed by connection problems; there were a multitude of mobile phones, laptops, PCs, an Xbox One and a PS4. It took us about 30 minutes to leisurely install the products, this should include the moment we opened the box to the actual setup and actually being able to connect to the network. The appearance of the router is quite sleek but the base is bigger than some. In total the router offers 1.75 Gbps in total bandwidth; this would of course include the 1300 Mbps at 5 GHz and 450 Mbps at 2.4 Ghz. For a practical router it can easily support 802. 11ac, the next generation of Wi-Fi all the while being connected to multiple other devices. Another feature that we loved is the one touch WPA wireless security encrypted alongside the WPS button. We also tried the easy setup assistant which was simple enough, but it was also thoughtful of the manufacturers to include multi-language support. The router has a 2 year warranty and the owner is promised unlimited technical support; there’s even a TP-LINK Live 24/ technical support. Of course the price is an obvious pro, you won’t get this amount of quality and performance even with routers twice or thrice the price of the TP-Link Archer. The USB Port is not a USB 3.0 connection, of course the USB 2.0 can also do the job but people prefer the USB 3.0 because of the speed. All in all the TP-Link Archer can only accommodate up to 4 wired connections. Not ideal for a busy network of 20 or more wireless devices. Gaming routers, or any router for that matter, comes in all shapes and sizes so what is the best router for gaming? Well we can’t provide a definite answer for that since a ton of unique and individual factors will come into play; there’s the internet connection, shape and size of the area’s structure, usage, number of devices, personal preference and so on. Even the best mbps for gaming differs from one circumstance to the next. But what we can do is recommend a good router for gaming by none other than ASUS. The ASUS RT-ARCH13 can easily fit into your budget, provide amazing speeds fit for gaming and can offer a ton of other features. Since a lot of people out there are quite picky when it comes to the USB port of their routers, we’re happy to inform you that the ASUS RT-ARCH13 features a USB 3.0 port; you can share media files and documents all day. The ASUS Router app has helped us manage our entire network from anywhere in the area with only the help of a mobile device. The router setup was also a breeze all thanks to their web-based interface, nothing was all that difficult and the setup even felt like child’s play. In order to better improve the Wi-Fi range, the router includes four external 5dBi antennas; the signal is strong, stable and fast. First and foremost it’s budget friendly, no matter what angle you look at it from. But keep in mind that it keeps up with astonishing network loads. The ASUS RT-ARCH13 offers long range, we had stable connections even on a floor above the router. There’s a 2 year warranty, because who doesn’t love warranties? I appreciate the effective bandwidth prioritization among devices; we tried to set a desired speed on certain devices and it worked like a charm. Compared to other routers at this price range, we didn’t have to restart the ASUS RT-ARCH13, not even once. The LED can be turned off, sure you won’t be able to notice them in your dining room or living room but it’s a whole different story when you place it in your bedroom. It’s not bulky or all that demanding in terms of space, we can even say that it has a sort of charm to it in terms of design. Parental controls are available and they’re as effective as with any other ASUS routers out there. A guest network is available, one that we can easily manipulate so we could limit the bandwidth to certain devices. Wireless printers can only be 10 feet away from the router, beyond that the connection can be quite weak. In order to properly function the firmware must be successfully installed at all times, the latest one for that matter. Not as fast as we would normally like but it still corrected all our initial judgment. Overall in terms of pricing and functions the ASUS RT-ARCH13 is above satisfactory, well you can’t expect the fastest router in the world but it’s still quick and durable. When gaming is concerned, we’re pleased to say that our gaming session went by smoothly and with no connection problems whatsoever. There were even a couple of other wireless devices connected from the start and up to the end of our gaming session. We highly recommend this for users that want to try out a new router and those that were failed by the previous routers. We would give it a rating of 6 out of 10, above satisfactory.